Fleetilla, an Ann Arbor-based asset tracking, fleet management, and IoT solutions company, and Dallas-based Polte Corp., a cloud-location-over-cellular (C-LoC) provider, are collaborating to integrate the latter’s location technologies into the former’s tracking and freight visibility solutions. Fleetilla’s FL950 series hardware, along with its cloud-based asset management application, manage semi-trailers, rail wagons, land-based inter-modal containers, rental equipment, and other assets. Polte’s C-LoC solution leverages available 4G and 5G signals and cloud-based machine learning to enable accurate location both indoors and outdoors. Polte’s patented algorithms offload location calculations from devices and compute them in the cloud, reducing time-to-market. With the addition of Polte’s location technology, Fleetilla says it will be positioned to offer seamless freight and equipment visibility across the supply chain. “Location is the foundation for all of the supply chain visibility and digital freight revolution that we are witnessing today,” says Pradeep P. Kumar, president and CEO of Fleetilla. 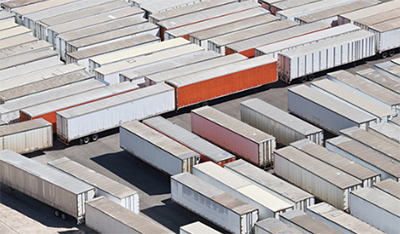 “In order to connect the dots seamlessly, equipment and freight need to be tracked on the road, as well as at the factory and the warehouse. “Polte’s breakthrough location technologies, coupled with Fleetilla’s nearly two decades of expertise in design and deployment of long-life, wide area outdoor location solutions, will allow us to now offer seamless end-to-end supply chain and equipment visibility, indoors and outdoors,” he adds.